Ah, summer’s just about here. The season of my birthday and the season in which I got my heart operated on. It seems like a good time for some reflection. I’ve got an extra week this month and I’ve been kind of mulling over what I’ve been doing on this blog. So, I thought I’d write it out and if anyone had any reactions to it or suggestions, they could let me know in the comments. Folk Tale Secret Stash: Secret Stash is the one I started this blog with and in some ways one of my favorites. There is a slight problem, though. I haven’t really read any of my folk tale books in a while. I’m working my way back into rereading them, but it’s going to take a little bit of time. So, the Secret Stash columns may be a bit few and far between for a while. They’ll never go away completely, though. Fantasy Literature Rewind: Rewind should go on as it usually does. I have some stuff lined up. I have My Own Fairy Book by Andrew Lang, The Enchanted Castle and Five Children and It by E. Nesbit. There’s also some stuff I need to reread in order to spotlight it like The Wind in the Willows by Kenneth Graeme and the fairy stories of both Oscar Wilde and Frank Stockton. I’m also considering a couple of less orthodox posts. I’ve been considering touching on some more 20th Century stuff that we probably know best from movies like Bambi by Felix Salten, One Hundred and One Dalmatians by Dodie Smith and Chitty Chitty Bang Bang by Ian Fleming. I’ve also been considering a look at the rare pieces of adult literature that sometimes work their way into people’s fairy tale canon like Gulliver’s Travels by Jonathan Swift and A Midsummer Night’s Dream by William Shakespeare (and yes, I do already own most of these books I've mentioned). I know this seems like a lot, but I got kind of fired up by getting to read The Jungle Book again. So, it’s going to take a while to get to it all. Some stuff may wait until I can tie it in with the inevitable movie remakes that will happen. Also, some fairy tales fall in a space between these two like those of Giambatista Basile and Charles Perrault, so if I write about those they’ll probably just be stand alone posts rather than under one of the title cards. 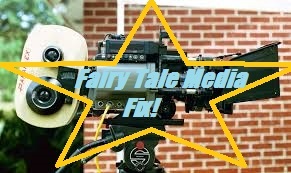 Fairy Tale Media Fix: Media Fix is another one that likely isn’t going to change much. 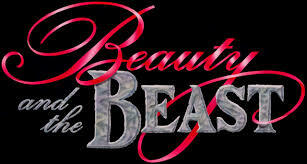 There are a few fairy tale inspired movies that are coming out. So, I’ll review those. I’m going to try and keep it focused on stuff that’s based on actual folk-derived fairy tales, though. You’ll notice that I opted not to review the new Jungle Book movie despite the fact that I loved it. Instead, I decided to write a FLR about the book that inspired it. This is largely just to keep me from being overwhelmed. I also want to do more “Tales from the $5 DVD Bin” because there are just so many bad or cheap fairy tale movies and cartoons out there. You may be seeing one of those sooner rather than later. Four-Color Fairy Tales- Honestly, unless you count all of Zenescope’s Grimm Fairy Tales series, fairy tale comics can be a little bit few and far between. So, this is actually a column that I’m going to expand in scope to include stuff based on children’s literature. There’s some stuff out there with interesting titles like Peter Panzerfaust and Pinocchio the Vampire Slayer. I’m also probably going to shine the spotlight on some graphic novels that were created directly for the book market rather than for the comic book specialty market. Also, there might be some retro reviews for stuff like X-Men Fairy Tales and Lullaby. The Stuff of Legends- We are so close to the end of The Stuff of Legends. The idea for it originally came from my desire to write about characters like King Arthur and the Pied Piper, but then I expanded it to twelve different legendary characters. It was also designed as kind of a counter to Folk Tale Secret Stash because other than one or two characters, all the characters I wrote down were pretty famous. I’ve written about ten of them so far and have two to go. After that, I’m considering a revival but not right away. If I do, there will also be a slight format change so that I can talk about different types of legend s (ghost stories, urban legends, tall tales, cryptid legends) as well as legendary characters. The Top Seven- The Top Seven pretty much exists for those rare moments when I feel like being Buzzfeed. So, the lists will come when the idea strikes me. They take a lot of work to research and arrange. So, that is a factor. Once Upon a Pixel- This has been the title I’ve used pretty much every time I’ve focused on video games. So, I’m probably going to start giving this one an actual title card. I’ve been considering doing pieces on folklore references that show up in classic franchises like Super Mario Bros. and Pokemon. I also do want to do something with Song of the Deep when it comes out, but it will depend on whether I can get access. Otherwise, you probably won’t see this column too much. There are time, money and hardware issues. 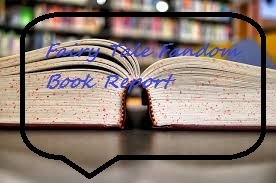 Fairy Tale Fandom Book Report- Now this is where the big changes are probably going to come into play. I never really planned on focusing on contemporary fiction because there are so many blogs that already focus on that. It originally came about just because I wanted to talk about the Sisters Grimm series of children’s books by Michael Buckley. However, it’s also the one that gets people to contact me and ask to review their books. The truth is that I’m not crazy about doing it. I prefer digging up the retro stuff. It might be a different matter if I made any money off this blog, but I don’t. Also, my disinterest kind of harms the people asking for the reviews too. Once I have the review copy on my kindle, I’ll end up leaving it to sit for months if I’m not excited about reading it. By that time, the book is “cold” and my reviewing it does little to help their initial publicity. So, I’ve decided that in the spirit of this particular blog I’m going to refocus on the weirder fairy tale adaptations for this column. The ones that mash things up with other genres or do crazy twists to the concept that really catch my attention. Basically, expect more stuff like The Lunar Chronicles and Time Lord Fairy Tales and less stuff like The Northlore Series or The Ugly Stepsister. If someone does want to pitch me a book to review, they should definitely be on their A game and be prepared to catch my attention. First rule of thumb: try to avoid a pitch that uses overused words like “dark”, “twisted” or “fractured”. That’s about it. I’m thinking about a few other things. Once Stuff of Legends is done, I’m thinking about doing a limited run series in which I try to make recipes inspired by fairy tales (I even have a crock pot recipe called Cinderella Stew). I want to do a post on fables the same way I did one on nursery rhymes. This summer I also want to visit some of the local amusement parks that use fairy tale themes and take some pictures for a spotlight post. I’ve also considered tackling some bigger issues like cultural appropriation in regards to fairy tales and storytelling, but that would take some big time research. As usual, my posts will continue to be exploratory in nature. I just get an idea, research it and post my thoughts. If anyone has any ideas, thoughts, comments, concerns or you just want to get on my case for wasting a week doing a “housekeeping” post, let me know in the comments below. 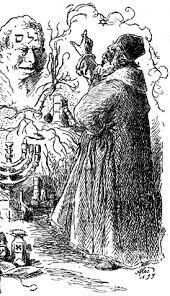 The Stuff of Legends: Rabbi Judah Loew and the Golem of Prague. Welcome back to The Stuff of Legends! Once again, we’re looking at a story from somewhere in the world that’s steeped in both folklore and history. This story, more than many others actually shows how the historical side and the folklore sides can actually come into conflict. This is the story of Rabbi Judah Loew and the Golem of Prague. The story goes like this. In Prague in the year 1580, the Jewish community was under threat by a priest by the name of Taddeush. Taddeush was baiting non-Jews into attacking the Jews by means of Blood Libel. Blood Libel is an age old practice of accusing Jews of ritually murdering Christians to use their blood for religious ceremonies. As should be obvious, this is an outright lie (hence the use of the word “libel”). It’s safe to say that it was a dangerous time to be a Jew in Prague. Now, among this community was a great scholar and teacher by the name of Rabbi Judah Loew ben Bezalel. When faced with this crisis, Rabbi Loew started to receive dreams from upon high telling him that he could protect the people if he built a golem. Using the instructions he received from his dreams and his own studies of Kabbalah, he along with his son-in-law and his student, built the shape of a man out of river clay. Then, through some very exact and esoteric rituals (some of which are described in different versions of the story found online), they brought this figure to life. Now, some sources I read say that the golem was animated by the true name of God being written on a piece of paper and placed in the golem’s mouth. Others claim that it was the word emet or “truth” inscribed on the golem’s forehead. In order to render the golem inert, the e needs to be erased creating the word met or “death”. However, as the story goes, the golem went about its business at the behest of Rabbi Loew. He would use his tremendous strength to protect the Jews of Prague and do manual labor. He even had a name: Josef. The only rule was that the golem needed to be rendered back into inert clay again for the duration of the Sabbath. Now, stories vary as to the destruction of the golem. The simplest and possibly most fitting is that the golem’s services were no longer needed and Rabbi Loew saw that and simply deactivated him. Another story claims that the golem started to become more and more violent and when he went on a destructive rampage, at which point Rabbi Loew deactivated him. Yet another story claims that the golem actually fell in love and when he was spurned he went on a destructive rampage after which he was deactivated. Whichever way the story goes, the golem was interred in the attic of the synagogue where it was left to crumble to dust until all that was left was the outline of a man. Not a bad little story, right? Honestly, considering all the persecution the Jews underwent throughout history, it makes sense that they’d develop a legend about a super-strong protector (well, other than Superman). So, what could possibly be the problem with this legend? Well, it seems like just with the story of Frankenstein that this legend is often compared to, the monster has started to overshadow the man. You see, the Rabbi Judah Loew ben Bezalel, also known as the Maharal, was a real person. He was considered to be one of the greatest Jewish scholars of the 16th Century. He wrote numerous books on Jewish law and morality. He established a prestigious Talmudic school known as the Klaus. He spoke out against Nadler, which were sort of slurs against legitimacy which could sabotage someone’s ability to get a marriage match. Rabbi Loew was also supposedly very skilled in the sciences and mathematics and was friends with scholars like Tycho Brahe and Johannes Kepler. There are even those who say that the story of the Golem doesn’t fit with the Maharal’s story because he would likely be against the act of trying to create life. Despite all this, it’s the story of the Golem that seems to get all the attention. I’ve even read a couple of sources where the authors seemed a bit exasperated by this. It’s not hard to see why. While many of the good Rabbi’s accomplishments are admirable, they’re also a bit insular. They are of great interest to those within the Jewish community. However, a grand tale with supernatural elements like the story of the Golem is likely to get people’s attention across cultures and across faiths. It will draw the attention of anyone who ever felt the need for a protector or could imagine what it was like to feel persecuted. Heck, it drew the interest of a non-Jew like myself. That’s why I’m writing this. 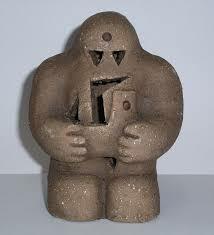 Whether some people like it or not though, the story of the Golem seems like it is unlikely to go away. Popular culture has latched onto the story. There was a 1915 horror film entitled The Golem. There was also another Golem-related horror film in 1966 with the less than descriptive title of It! The Golem has appeared in the Disney action cartoon Gargoyles. The Golem of Prague also appeared on one of the Halloween episodes of The Simpsons. Golems of different sorts appear in the Castlevania video game series (though, the one in the video seems more like a Frankenstein-type monster). There was even an episode of Grimm featuring a golem. That doesn’t even get into the appearances that the Golem has made in comic books. For example, back in the '70s when Marvel was having a boom in supernatural characters, the Golem appeared in the title Strange Tales. Speaking of comic books, I'd be remiss to forget that the Golem is also mentioned numerous times in Michael Chabon's novel The Amazing Adventures of Kavalier and Clay about the early days of the comic book industry. 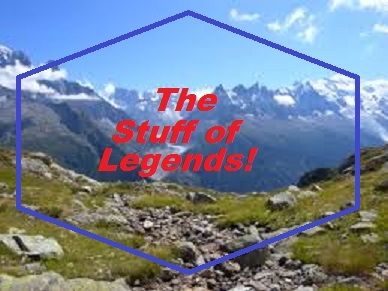 Now whether you’re interested in man or monster, protector or holy man, I’m sure most people can agree that they are both deserving of being The Stuff of Legends! Fairy Tale Fandom Book Report: Time Lord Fairy Tales. Okay, so it seems that publishers are just making books tailor-made for this site to review them now. That right there is a picture of me holding the book Doctor Who: Time Lord Fairy Tales. I’ve become a big Doctor Who fan in recent years. You may recall that when this blog first started, one of my earliest posts was one in which I compared story elements from Doctor Who with those in classic fairy tales. Now, two of my cultural obsessions are coming together in a much more official way. What can be said about this book going in? Well, the whole thing is written by an author named Justin Richards and it’s illustrated by David Wardle. The blurb on the back says “Fifteen tales of ancient wonder and mystery, passed down through generations of Time Lords”. Now, if that’s true, then Time Lord culture must be very, very similar to our own. These stories are very familiar. There are pretty much two ways to create books of fairy tales around existing franchises. You can either create brand new stories that exist as the tales told in the world that’s created (like J.K. Rowling did with The Tales of Beedle the Bard) or you can just recast popular tales using elements from the franchise (like the Marvel Fairy Tales comics that were published years ago). Time Lord Fairy Tales chose to go the latter route. In fact, there’s only one story that I don’t immediately recognize from somewhere else (#13- “The Grief Collector”. If anyone knows the root of this story, let me know in the comments). Now, does that make this book bad? No, not really. There are still some really fun stories here and seeing how they’ve been changed to reflect the Doctor Who universe is kind of interesting. Also, while the stories sometimes start off very similar, they can go in some very different directions. The story “Snow White and the Seven Keys to Doomsday” is only similar to “Snow White” in certain parts. The rest is a story about a girl trying to stop an evil dictator from controlling a horrible doomsday machine. As a collection of science fiction fairy tales, it doesn’t really offer anything new or different. Also, you never spend enough time with any of the main characters to really fall in love with them like you would with something like The Lunar Chronicles. I mean, I was glad things turned out well for them, but I was never really clamoring to see more. There are some interesting choices made in terms of Doctor Who mythology. The Doctor only appears in a handful of stories and is a side or background character in almost all of them. This actually makes a lot of sense, considering the character of the Doctor. He really works better in this setting as a magical helper of sorts. He’s so knowledgeable about the ways of the universe that all mystery and magic would get sucked out of it all if he were the main character. Instead, the main characters are the types who would usually be companions or one episode supporting characters. Even when he does appear, you can instantly tell it’s him. Heck, you can even tell which version of him it is (there have been twelve different versions of The Doctor) by his dialogue or the character’s description. The author also seemed to try his best to get the Doctor Who creatures and locations to fit the stories that were chosen, even to the point of leaving out some of the more popular ones. The Doctor’s nemesis The Master, never appears in this book. Neither do the Daleks, possibly the most popular race of antagonists in the TV show’s history. Instead, we get the Sontarans in two different stories, once as pigs in a “Three Little Pigs” riff and once as a troll in a take on “The Three Billy Goats Gruff”. The Cybermen appear in a “Pied Piper of Hamelin” based story. The Slitheen appear in an “Ali Baba” type of story. It all fits too. Every choice works with the kind of character or alien race they are. There are even some more obscure creatures like the Nimon and the Wirrn in there. Even though I’m a fan, I had to look those ones up in another tome that’s in my possession. If you’re not that knowledgeable about Doctor Who stuff and still want to read this book, don’t worry. It’s not completely necessary that you know all about these creatures. Overall, the book is fun but nothing particularly new and different. I don’t think it was aiming to be, though. Most likely, it was meant to be a book that combined familiar fairy tales and familiar Doctor Who concepts to create a sort of fusion literary comfort food for kids over in the UK. Yup, kids. 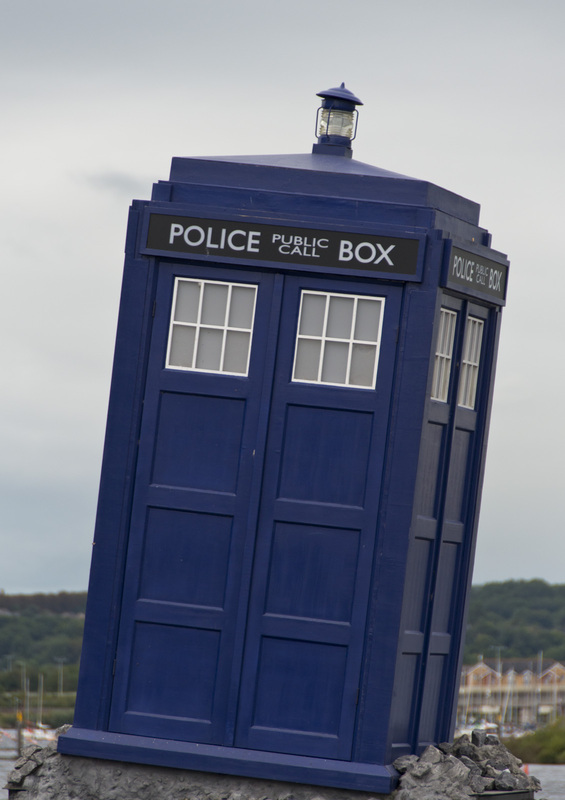 Despite the majority of Doctor Who fans in the United States being full grown genre fiction fans like myself, it has always been considered a family show in its home country of Great Britain. And though it says “Dark, beautiful and twisted, these stories are filled with nightmarish terrors and heroic triumphs” in another part of the back cover blurb, it’s really not all that dark. At least, no darker than a normal episode of Doctor Who (so parents, have no fear). I even wouldn’t mind seeing some of these stories be used as the basis for some real Doctor Who episodes, providing they ever find a way to make it work. Really, it’s just a fun little treat of a book. Fairy Tale Media Fix: Snow White with the Red Hair. So, a while back I was on Hulu and was browsing through anime titles and I find the interesting title of Snow White with the Red Hair. Being the fairy tale geek I am, I was intrigued. So, I decided to give the show a watch. Snow White with the Red Hair is based on a shojo manga (translation: girls’ comic) by Sorata Akizuki. The show and comic are about a young woman named Shirayuki. Shirayuki is a skilled herbalist with very, very red hair (like apple red, not carrot red). When the prince of her home country decides to make her his concubine, she chops off a length of her hair, packs up her belongings and runs away. As she runs away, she comes upon Prince Zen of the neighboring country of Clarines and his attendants Kiki and Mitsuhide. The rather free-spirited Prince Zen takes it upon himself to solve the problem with the local prince. 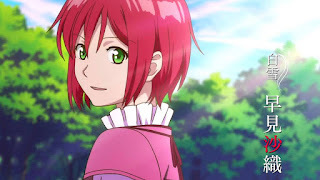 Shirayuki then follows Zen to Clarines and takes a spot as an apprentice herbalist at the palace. The rest of the series focuses on Shirayuki adapting to her new surroundings, working towards her goal of being a court herbalist and her friendship with Zen as it evolves into something more romantic. The truth is, not much. Remember in my RWBY review how I said that I would be looking at some media that didn’t adapt the tales directly? Well, this is the other one. Now, don’t get me wrong, there is some “Snow White” in there. The name Shirayuki actually is the Japanese translation of Snow White. “Shiro” is “White” while “Yuki” means “Snow”. Also, there are very strongly felt echoes of the story in the first episode. The prince of Shirayuki’s home country, Prince Raj, plays the part of the Evil Queen. Only instead of wanting to be rid of Shirayuki, he wants her all to himself. Also, while the Queen’s actions are downright villainous, Raj’s actions are played as more comedic. Shirayuki, like Snow White, seeks refuge in a house in the forest where she meets those who would help her. Prince Zen even jokes that she can’t treat him like “some dwarf”. There’s even a poisoned apple plot. However, the similarities stop there with the first episode. So, what could possibly have influenced the show’s creator to invoke the name of “Snow White”? Perhaps it’s best to look at the show in terms of symbolism. It’s commonly accepted that fairy tales and their characters aren’t just loaded with symbolism but become symbols in human culture. Possibly the most fraught with symbolism is Cinderella. When we speak of a “Cinderella story”, we mean the story of someone moving from rags to riches. A Cinderella story is ultimately a story of ascension. It’s such that there are both an Eminem song and a movie about boxer Jim Braddock titled “Cinderella Man”. Or how about “Little Red Riding Hood”? This story and the symbol of this story are often used to represent someone, usually a woman, led into dangerous temptation. The symbol of Red Riding Hood as the victim led astray and the Wolf as a predator of various kinds sticks with us and appears in various media. Or how about simply “Jack”? “Jack” who climbed the beanstalk, slew the giants, went off to seek his fortune, jumped nimbly over a candlestick among other feats. The name Jack is a common one, but it is generally a more familiar form of Jonathan or John. This combination of familiarity and commonality suggests an everyman. Further suggesting an everyman is the term “jack of all trades and master of none”, which suggests someone who is not particularly skilled in any area but dabbles a little at everything. There’s also another side of the name Jack. It can also mean a rogue or scoundrel. One antiquated term for a rogue is a “knave”. The term was commonly used to describe a certain type of card in a standard deck of playing cards. However, the knave soon became more commonly known as the Jack (I refer you here to the nursery rhyme “The Queen of Hearts”). This could also explain why roguish characters like Captain Jack Sparrow and Captain Jack Harkness are named the way they are. But what could “Snow White” possibly symbolize for the Japanese? Well, typically the tale of “Snow White” is seen as representative of the conflict between generations as well as the pitfall of vanity. The Queen, an aging beauty, seeks to destoy Snow White, a blossoming beauty, because she perceives that Snow White is taking her position as the “fairest of them all”. Ultimately, the Queen can’t destroy Snow White and is punished for trying. It’s important that we mention that here, because we can now rule it out. None of that really factors into the story of Snow White with the Red Hair. With the story’s focus on romance, it could represent love found in an unusual place. 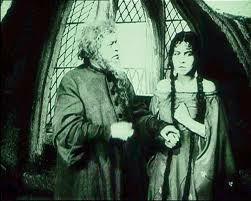 In the original tale, the Prince finds a woman who seems to be dead and becomes enthralled with her. She ultimately wakes up and becomes his bride. By the same token, Prince Zen finds Shirayuki in a place he does not expect, the house where he and his attendants are staying. Also, because she is a commoner, she is an unlikely person for Zen to find love with. This kind of drifts into territory more commonly associated with “Cinderella”, though. It’s possible that Snow White could represent inner beauty that surpasses even great outer beauty. In the tale, both the Queen and Snow White are physically beautiful. However, it’s Snow White that the reader or listener ultimately sides with because the Queen’s actions mark her as evil while Snow White’s mark her as the innocent victim. 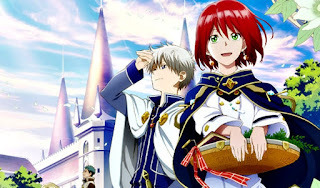 In the anime, much is made of Shirayuki’s red hair. The red of her hair is deemed rare and is what makes her so ardently pursued. However, it’s not her hair that Zen or the viewer will ultimately fall for, it’s Shirayuki herself. Much can also be made of Shirayuki’s chosen profession as an herbalist, and its parallel to the poisoned apple from the original fairy tale. The two are almost opposite sides of the same coin. Both are representative of the hidden nature of plants. However, while the apple is the ability for plants and nature to harm, Shirayuki’s position as an herbalist shows their ability to heal. A similar dichotomy was represented by Leafe in the anime Pretear, which is also based on “Snow White”. Ultimately, this is all just speculation. There could be even greater symbolism that I haven’t touched on. However, what about the anime itself? Well, it’s pretty good. I’m hardly the target audience for this show, being a 30-something American man. That aside, it’s a really sweet show. 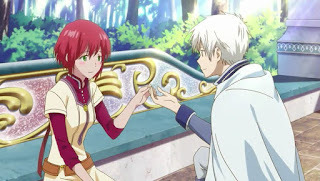 The centerpiece of the whole thing is the relationship between Shirayuki and Zen. The show also really earns its moments. You watch patiently as Zen and Shirayuki’s relationship builds and when their first kiss happens, it feels like it was worth the wait. That’s not all there is to it, though. The website The Mary Sue recently put up an article lauding Shirayuki’s character. I agree with what they say regarding the character’s strength and her ability to show it while still exhibiting more commonly female traits. However, I think even more notable is her sense of balance. She loves Zen, but still focuses on her work as an herbalist rather than simply being oriented around love. Also, she doesn’t push Zen away when he reveals his feelings. Maybe this is because I’m more used to viewing boys’ anime than girls’ anime (something that’s becoming less common the longer I work on this blog) but I’m not used to seeing anime where the characters have complex, varied lives rather than some degree of single-minded obsession. It’s actually rather refreshing. If you like sweet romance stories, there’s a good chance you’ll like this show. It’s probably not for everyone, but I’m sure it wasn’t intended to be. You can find the series on Hulu as well as on Funimation’s web site. Now whether or not you see any of “Snow White” in it is up to you.